Armed with only a weird Albanian car and their wits, The Griswolds head across the country in a new all-ages trailer for New Line Cinema's Vacation remake, following the red band trailer that debuted last month. This trailer offers plenty of new footage, including more of Rusty Griswold's (Ed Helms) rambunctious young sons, Rusty's annoying and inappropriate brother-in-law Stone Crandall (Chris Hemsworth) and a disgusting "hot springs." We even see more of Chevy Chase's Clark Griswold, who tries to encourage his son of fulfilling his dream to take his family to Walley World. 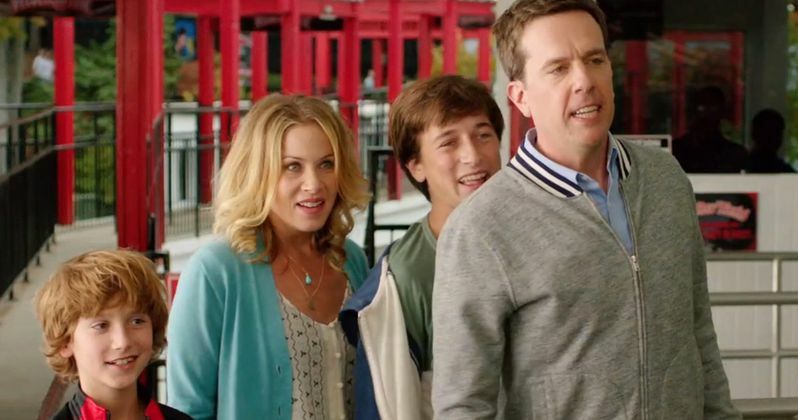 John Francis Daley and Jonathan M. Goldstein, who wrote the scripts for The Incredible Burt Wonderstone and Horrible Bosses 2, make their directorial debuts with Vacation, arriving in theaters July 29. Does this new footage make you even more excited for Vacation? Or will you just watch the original over and over again this summer? Chime in with your thoughts below after watching the new all-ages trailer.